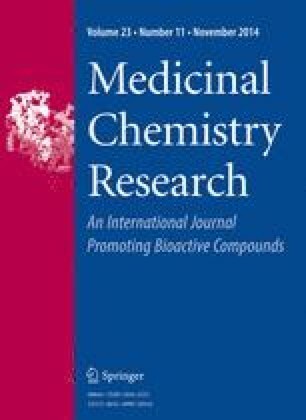 A series of 3-(4-substitutedphenyl)-N-(5-(4-substitutedphenyl-1,3,4-oxadiazol-2-yl)but-2-enamide were synthesized using pharmacophoric elements for in vivo anticonvulsant activity yielding two potent candidates (4d and 4j) in the Phase I and Phase II screening employing maximal electroshock seizure and subcutaneous pentylenetetrazole test having minimal neurotoxicity. Their Phase II screen depicted an increment of nearly 2–10 times for MES and 7–67 folds for scPTZ in the therapeutic index and protective index—the two mainstays in the drug discovery. A correction to this article is available online at https://doi.org/10.1007/s00044-019-02339-z. The authors are thankful to Jamia Hamdard New Delhi, India, for providing facility for research work. One of the authors (M. Jawaid Akhtar) expresses thanks to University Grant Commission (UGC) New Delhi, India, for the financial assistance.